After my daughter was born, Culinate's recipe editor, Carrie Floyd, brought us this dish for dinner one night. Nearly two years later, I finally got around to looking up the original recipe — from Amanda Hesser's memoir Cooking for Mr. Latte — and decided to come up with my own version. It's excellent on a cold winter weekend. Cook the pasta: Bring a large stockpot of water to a boil, salt the water, and add the dried pasta. Cook until al dente, about 15 minutes, then drain. Put the cooked pasta in a large bowl and set it aside. Preheat the oven to 350 degrees. While the pasta is cooking, use 1 tablespoon of the butter to grease a 9-by-13-inch casserole dish. Make the sauce: Put the remaining 2 tablespoons of butter in a large saucepan and melt, over medium heat, until foamy. Whisk in the 2 tablespoons of flour, then slowly whisk in the milk. Whisking occasionally, bring the mixture to a simmer and cook, stirring, until it starts to thicken. Add the cheese, stirring it in with a wooden spoon, until it starts to melt. Remove from the heat and continue stirring until the cheese has melted. Season with pepper to taste, then pour the sauce over the cooked pasta. Prep the tomatoes: Drain off the tomato juice from the can of tomatoes into a medium bowl. Pour the diced tomatoes into a sieve set over the bowl and press lightly to get the rest of the juice out. You should have about 1 cup of diced tomatoes remaining in the sieve. Add the tomatoes to the sauced pasta. 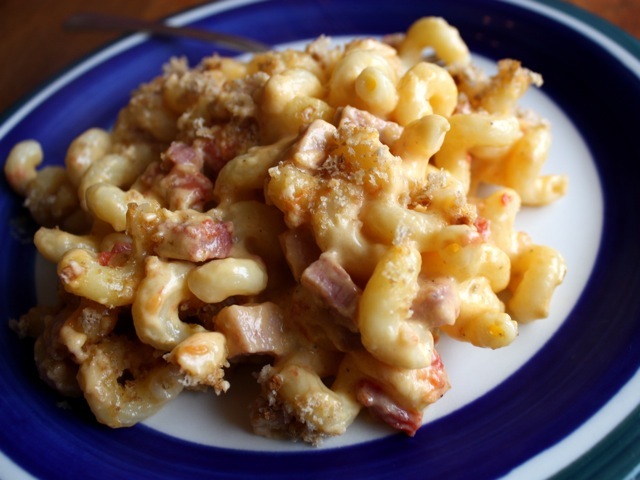 Assemble and bake the dish: Add the cubed ham to the pasta mixture, then scrape the mixture into the prepared casserole dish. Scatter the breadcrumbs evenly over the casserole, then bake for 25 minutes, until bubbling and lightly browned on top. Serve hot, with a dusting of minced parsley if you like. Make your own breadcrumbs by ripping up stale bread into smaller chunks, then blitzing them in a food processor. Store breadcrumbs in the freezer until needed. For a richer mac'n'cheese, use 1 cup milk and 1 cup cream instead of 2 cups milk. If you want to use fresh tomatoes instead of canned, core and de-seed a few ripe tomatoes before dicing the remaining flesh. Put the diced tomatoes in a colander or sieve and gently press on them with the back of a spoon to force out any excess liquid. You can swap out the ham in favor of canned tuna. Drain two cans (about 5 to 6 ounces) each of tuna (preferably from a sustainable fishery, such as the Oregon albacore fishery) and flake the meat. Add it to the pasta just before assembling and baking the dish.